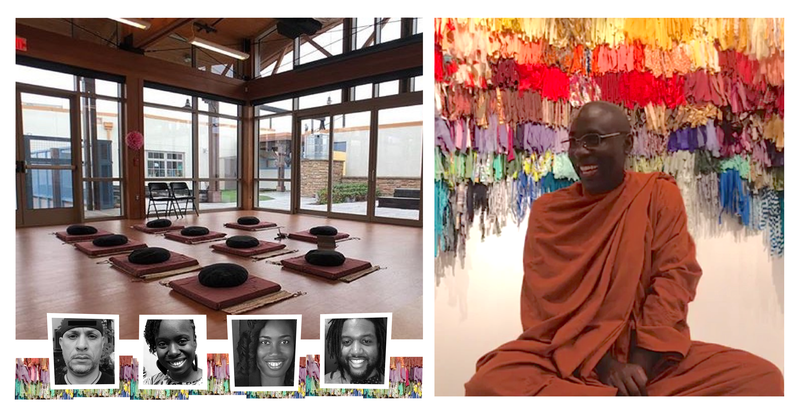 Led by Ugandan Buddhist monk, Bhante Buddharakkhita (b. Steven Jemba Kaboggoza; bio below), this meditation retreat is specifically for those people from communities of color who are immigrant Americans or reside in America and who consider themselves as indigenous, enslaved, colonized, disenfranchised, and/or marginalized. People of Color retreats are especially intended to provide an affinity group for individuals who daily confront the effects of racism. We ask that all participants attend the program in its entirety. The program is designed for all to feel comfortable, comprehend, and hold interest — whether you are a beginner, experienced, or committed meditator of any discipline. Consider inviting a meditation buddy to attend with you (it’s a nice supportive practice). Included in the program will be guided meditation, Dharma Talks, walking meditation, yoga movement, Dyads, and Q&As. There will also be an Art As Insight Workshop. Assisting Bhante from the NCMC board community will be instructors Andrea Lee, Kamilah Crawley, and J. Javier Cruz, and announcer Ihsaan R. Muhammad. (Bios on the Leadership Page of our website.) A vegan meal will be served. The venue is in a state-of-the-art LEED-certified green building with wheel-chair and elevator access. If the weather is nice we will also use the adjoining Outdoor Courtyard to the Atrium Room during some of the movement sessions. It is an easy and direct .6 mile/11 minute walk from Newark Penn Station. Street parking is available in the area. Bhante Buddharakkhita’s most popular book, Planting Dhamma Seeds: The Emergence of Buddhism in Africa and his most recent book on meditation, Sowing Seeds of Peace, will be available for purchase. All proceeds after costs will go to his center in Uganda for their projects such as the Peace School for Children, Orphan Project, and Women’s Livelihood Project. *Donations go to cover program expenses and gifts to teacher and instructors. 9:00-9:15 Participant Arrival. Please arrive no later than 9:15. Bhante Buddharakkhita was born and raised in Uganda, Africa. He first encountered Buddhism in 1990 while living in India, and he began practicing meditation in 1993. He was ordained as a Buddhist monk by the late Venerable U Silananda in 2002 at the Tathagata Meditation Center in San Jose, California and then he spent eight years under the guidance of Bhante Gunaratana at the Bhavana Society, West Virginia. He is the founder of the Uganda Buddhist Center in Uganda. Besides spending time at his Center, he is the spiritual director of Flowering Lotus Meditation Center in Magnolia, Mississippi. Bhante has been teaching meditation in Africa, Australia, Europe, Asia, and the U.S, since 2005. His book, Planting Dhamma Seeds: The Emergence of Buddhism in Africa, tells the story of his religious and spiritual work in Africa. His most recent book is Sowing Seeds of Peace. He is a Visiting Monastic Teacher with Newark Center for Meditative Culture in New Jersey. He is on the council of advisers to Buddhist Global Relief in New York. Newark Center for Meditative Culture is a 501(c)(3) non-profit organization serving a diverse urban meditation community. Your tax deductible donations make it possible for us to deliver life-changing programs to the Greater Newark community. All of our programs are offered as donation-based no-fee to the participant. Instead, we invite all participants to make voluntary gifts to the level of their ability, sometimes with suggested donation amounts. NCMC disperses the donations equitably between teachers and venue providers. We base this system on the practice of dana or generosity, which is inherent to many spiritual traditions. Contact us with questions at info@newarkmeditation.org. This entry was posted in Ancestral Domain, Buddhism, Day-long Retreats, Dhamma, Dharma, Insight/Vipassana Meditation, Meditation, mindfulness, People of Color, Spirituality and tagged #meditation, insightmeditation, newark nj, peopleofcolor, peopleofcolorretreat, vipassana. Bookmark the permalink.